Each year, along with the first glimpse of spring sunshine, comes the great British barbecue. I will always have a soft spot for cheap burgers and sausages, drunkenly cremated for ten minutes over red hot coals, before being stuffed into a bread roll with ketchup and cheese slices. But there's another - altogether more serious - side to barbecue. Slow cooking, tender meat, smoke, and lots of flavour. 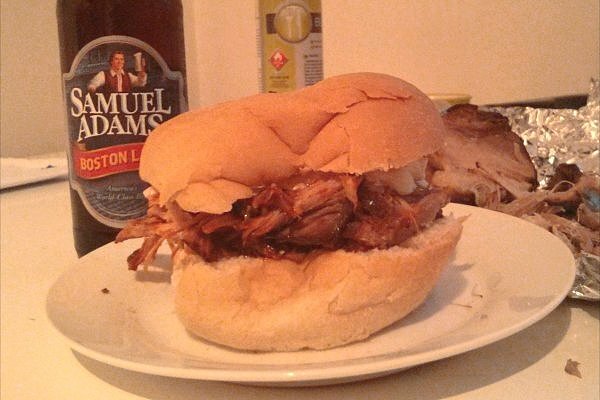 And arguably the classic American barbecue food is pulled pork. It's become a popular dish of late, but unfortunately that means that there are a lot of bad versions out there doing the rounds. It's not hard to do it properly, it just takes a bit of time and patience. 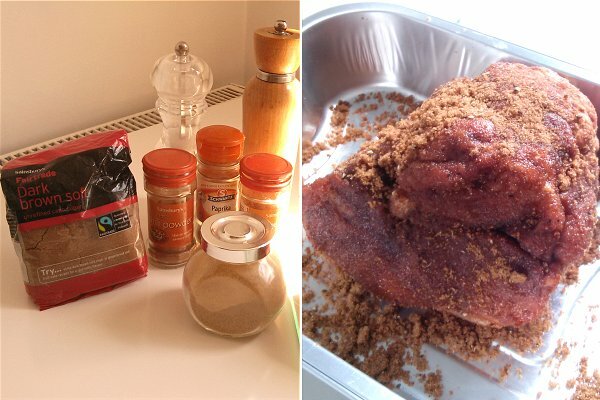 I started off by making a dry rub mix - brown sugar, paprika, cayenne pepper, cumin, chilli powder, salt and pepper. 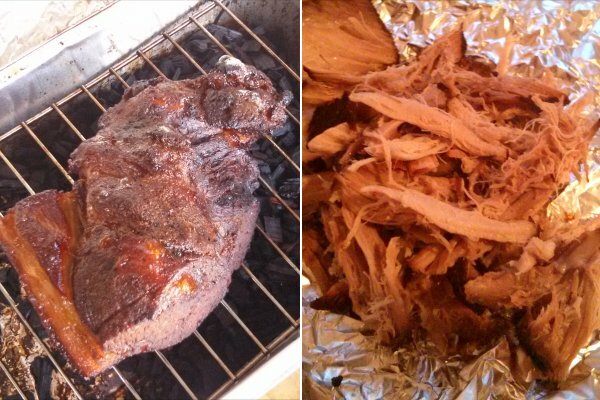 I rubbed it into a pork shoulder joint, and left in the fridge for a few hours. Barbecuing is not an easy thing for me to do, as I don't have a garden (I always feel a pang of jealousy when I sniff the air and realise that the neighbours are having yet another barbecue). Even a disposable foil barbecue is beyond my reach - let alone a full sized drum smoker. But luckily, it is possible to smoke food indoors... so it was time to prepare the Jerry Fishbiscuits (tm) custom smoker. 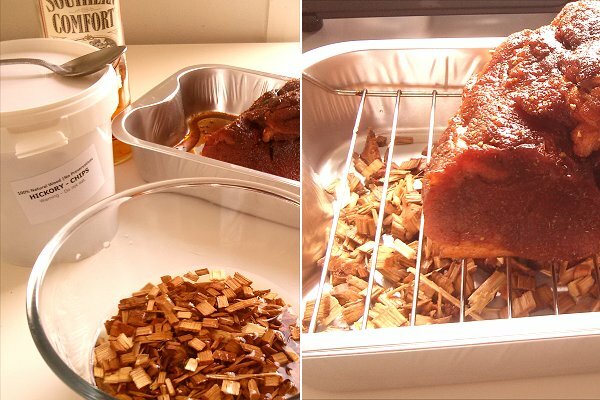 I took some hickory chips, and soaked them in Southern Comfort and a little water. I put the chips in the bottom of a foil tray, put the meat over them on the wire rack, and wrapped the whole thing tightly in foil, creating a sort of parcel. I'll tell you what NOT to do next... don't put foil directly over a naked flame, no matter how gentle, because it will burn right through it. 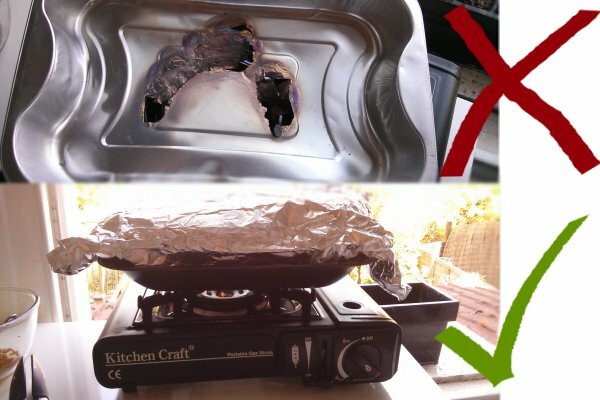 You need a proper metal roasting tin between the stove and your foil parcel. It might sound obvious to you - but it wasn't obvious to me. This thing takes a long time to cook... I left mine for a couple of hours, before replacing the smoking chips, and then smoking again for another two hours. I'd say that four hours is the bare minimum duration, but the meat was pretty tender by then, and disintegrated quite easily. 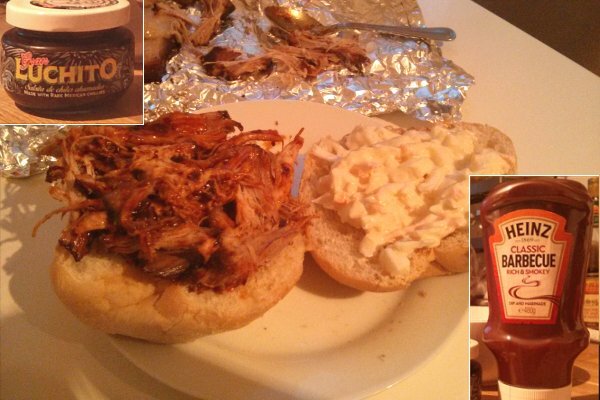 I doused the meat in a delicious mixture of barbecue sauce and smoked chilli paste, and ate it in a giant bread roll with lots of coleslaw. Retro Biscuit Ice Cream #1 - "Wagon Wheel"